This classic brandy apple pie never lasts long in our household — with premade crust and granny smith apples, this semi-homemade recipe is delicious fresh or as leftovers. Preheat oven to 425°. Remove pre-made pie crusts from box. Sprinkle flour on cutting surface & roll one out with rolling pin. Cut to size & place in pie pan. Save the other for later. Peel, core, & cube apples and place into a bowl. Mix sugar, flour, cinnamon, nutmeg, allspice, ground cloves, and salt into a separate bowl. Coat apples with this mixture. Add lemon juice and brandy. 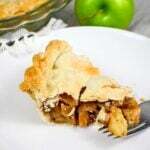 Place coated apples in pie pan. Add butter in slices over the mound of apples. Roll out second pie crust and cover over the apples. Overlap and pinch bottom crust to top crust to ensure no seepage on the edges during baking. With a sharp knife, add a few slits to the top pie crust. Bake 15 minutes at 425 °. Turn oven down to 325° and bake another 45 mins. Turn off oven and allow to cool down in the oven. Our family is pretty generous with the brandy, which is the “secret ingredient” to the flavor in this recipe. We usually add it by the capful, rather than traditional measuring. My granny always made her own pie crust for this recipe, but I found it was always too soggy on the bottom. Pillsbury gets it right! Allowing the pie to cool down in the oven will help make the filling less runny.